For all those of you who have asked us what's going to be on our new Dessert Menu, we thought we'd give you a sneak preview. We just finalized it today and will launch next week. We still have our most popular item, of course - Scones! With or without clotted cream, served warm with butter and strawberry preserves. Next we have individual fruit tarts, also served warm: Apple, Peach and Raspberry/Blackberry which we call Berry Berry. We also kept the delicious Mango/Raspberry Mousse and the Yummy Bars (Raspberry/Blackberry as well as the Coconut/Key Lime). Tiramisu - the classic coffee and zabaione cream on a layer of sponge cake, soaked in espresso, dusted with cocoa powder. Profiteroles - puff pastry filled with vanilla cream covered in chocolate cream. Limoncello Truffle - a light, tangy lemon gelato with a heart of limoncello, covered in meringue. Cool, refreshing, tart. Chocolate Truffle Square - a layer each of white and dark chocolate mousse surrounding a cherry center, coated in chocolate. A chocolate lover's dream. 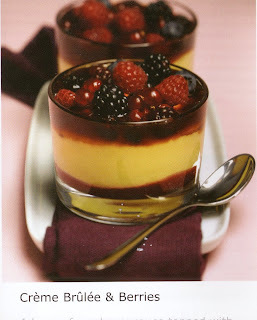 Our absolute favorite is the Creme Brulee with Berries. This is the one to travel long distances for. The one you will soon be craving. See you soon!